The trawler with heroin intercepted by law enforcement officers in the seas off the Southern Coast on March 24 had off loaded 175 kilos of heroin to Maldivian boats owned by traffickers there three days before the arrest of the nine Iranians nationals investigations, have revealed. The trawler laiden with heroin had started its voyage from Karachchi, Pakistan, 14 days prior to the interception. 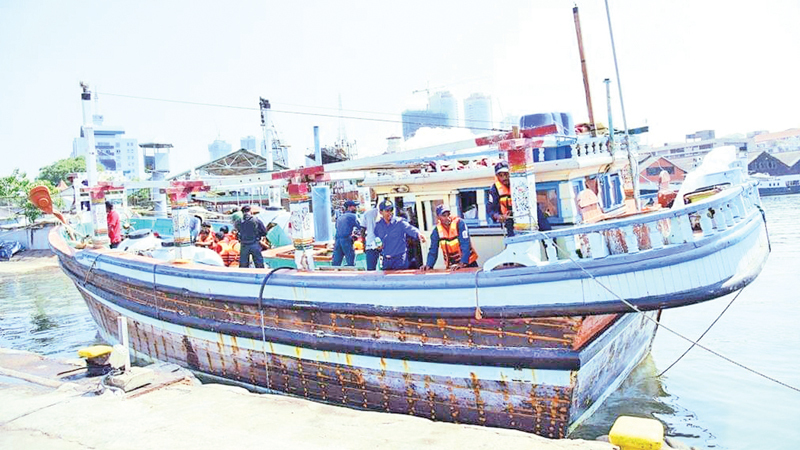 The Police Narcotics Bureau is trying to unravel information about the ships route and the accomplices of the Iranian traffickers by using satellite phones and GSP equipment found in the trawler. According to investigations the kingpin behind this heroin haul is Kirillapone Morril, an accomplice of Makandure Madush who had now fallen out with him due to a tip off given during the unloading or 128 laks of heroin at Devinuwara recently. To spite him for this Morril is said to have helped Dubai Police to apprehend Madush during the Kavish party thrown in a Dubai hotel. According to investigations Morril who had fled to England with his wife after the arrest of Madush and later returned to Dubai to carry out his usual heroin racket. Morril is said to be ordering heroin directly from Pakistan through the Pakistani racketeer who earlier served Madush. The heroin sent by this Pakistani had a unique seal which was also found in the heroin seized from the trawler in Southern seas. The 294 kilos of heroin seized from a car park in a Kollupitiya shopping complex too bore the identical seal (frank). Meanwhile, the nine Iranians arrested on March 24 were ordered to be interrogated under police detention until March 29 when they were produced before the Colombo Chief Magistrate Lanka Jayaratne on March 24. Police Narcotics Bureau said they would seek assistance from Iran Embassy interpreter’s during the interrogation of the suspects.